Sea Fishing in the South west seems to be a bit later this Year, allthough there are a few species being caught from Boat and Shore. From the Boat in Luce Bay there has been a few Thornback Ray ,small Bullhuss,Dogfish,Herring and Coalfish and from the Portpatrick and Portlogan areas there has been a few decent Haddock,Herring,Pollack and Coalfish and lots of small Whiting and Codling as well as the odd Plaice,Dogfish and Bullhuss. 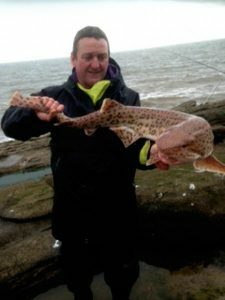 From Rock Marks on the West Side of the Peninsula there has been some sport with Pollack being caught on assorted Lures and Sandeel Baits,there has also been the odd Plaice,Dogfish and Coalfish as well as small Whiting. 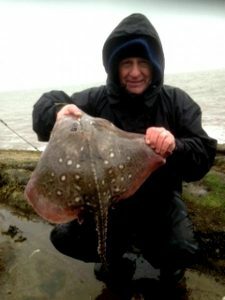 I Fished the Peever Spring Open at the Week-end just past , Fish were not in massive numbers but there were a few Dogfish,Dabs ,Flounder, Plaice as well as a Thornback Ray and a 15lb 6oz Bullhuss. The Captor of the Bullhuss was Stuart Ballantyne from the Ardrossan Club whom duly won the Heavy Bag and Heavy Fish Prizes,2nd was Alec Bell whom had the Thornback Ray which weighed 7lb 6oz and third was Adam Johnstone, Adam had the 3rd heavy Fish with a Flounder.